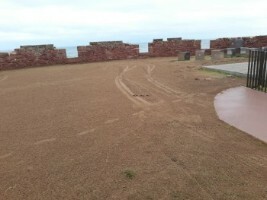 The grass area on the upper level of the Dunbar Battery has been temporarily closed off for essential maintenance to the grass area. We will put out the barriers to discourage foot traffic but ensure the amphitheatre and coastal garden remain open to the public. Thanks to Gordon, Craig and the team at ELC Landscape and Amenity for carrying out the work. They'll be keeping an eye on it over the winter to make sure it's in tip-top condition for next Spring. 'Fingers crossed' for good weather to let it take before the winter in earnest.